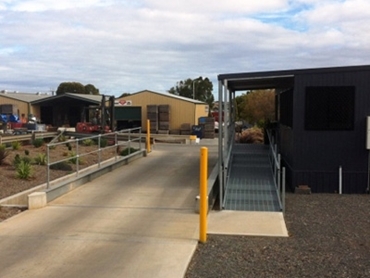 An Accuweigh weighbridge was recently installed at an Adelaide-based scrap metal dealer to track vehicles and product deliveries. Sold and commissioned by Accuweigh’s Port Adelaide branch, the weighbridge order also included the PC-based Ticket Aid Weighbridge Software for tracking vehicles and product deliveries. Accuweigh’s weighbridge was installed using an open-pit foundation with the weighing deck at ground level for easy truck access and to minimise space requirements on the site. The weighbridge has an extended width of 3.5 metres to assist with vehicle turning during entry and departure while the 12-metre length ideally suits the body trucks used exclusively at this site. Accuweigh’s concrete weighing deck is designed for heavy duty weighing applications with the significant mass of the concrete making for a more stable weighing structure, which is better able to resist weight fluctuations in windy conditions. The steelwork in Accuweigh’s vehicle weighbridge is fully hot-dip galvanised for superior corrosion resistance, providing an extended working life in industrial and wet environments. Accuweigh is a leading Australian supplier of weighbridges, operating eight branches across all mainland states and providing superior product support on all scales and weighing applications.